Formulated to help maintain joint mobility, EverFlex® provides important nutrients which are the building blocks for healthy cartilage in joints. Cartilage is the ‘shock absorber’ for the joints, protecting bone from wear and tear. 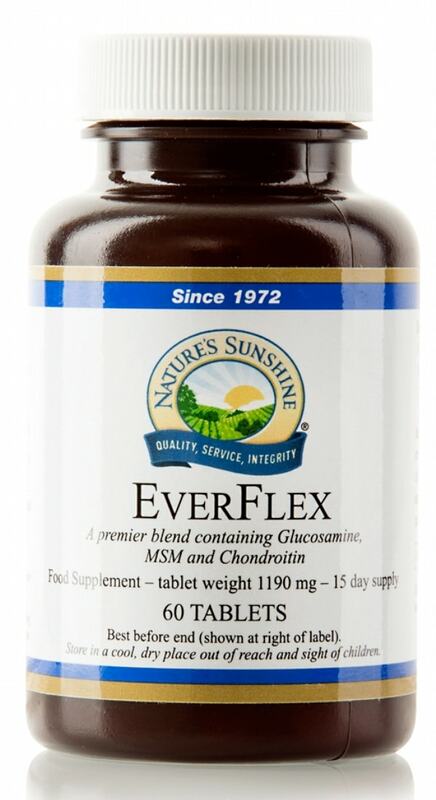 Nature’s Sunshine’s EverFlex formula offers the combined benefits of three key ingredients: glucosamine, chondroitin and MSM, in one convenient tablet. Glucosamine hydrochloride (from crustaceans) provides higher levels of active glucosamine than glucosamine sulphate. Chondroitin attracts and maintains fluids within the cartilage, helping to maintain elasticity and strength. MSM (methylsulfonylmethane), is a form of biologically active sulphur that is found in the human diet. Sulphur is important to joint health for a wide variety of processes. Ingredients: Glucosamine hydrochloride (from crustaceans), methylsulfonylmethane (MSM), chondroitin sulfate. Bulking agent; cellulose, anti-caking agents; stearic acid, silicon dioxide, magnesium stearate.